Following are a list of questions we are often asked about the GUEST program. Please don't hesitate to get in touch if you have further quesitons that have not been answered here. I am considering looking for a job onboard a yacht and have worked in a family restaurant for the last year, is it worth completing the GUEST Introduction modules? Will this help me to get a job? It’s great that you have some service experience. More so that you are considering an investment in developing your knowledge about the yachting sector and what is expected of you in the role of a junior stew. The introduction modules are designed to give you the basic skills and awareness required to start working on board a super yacht. The benchmark for expectations of owners and guests is that of a 7 star service. So there is much pressure to get it right from the get go and interior crew have to be multi skilled from service, laundry, housekeeping, valet, wine knowledge, cocktail making, to name just a few of the skill sets. GUEST is becoming more and more valued by Captains and Chief Stews, as the program provides a great tool and platform for them to know your level of expertise when they employ you. For the Chief Stews, it’s a positive bonus to employ someone who has come prepared and aware of the high end environment you are working in and that you are bringing relevant all rounded abilities to the team, not to mention that it saves them huge amounts of time with basic training, leaving more time to get on with learning about the yacht specific needs and guest expectations. Any formal training you have completed will personally give you more confidence and for sure the extra leg up with gaining employment. I have just completed my introduction GUEST training modules and my trainer told me I can now apply for a Junior CoC; what is a CoC and how can I do this? Once you have completed the 3 GUEST Introduction modules, hold your STCW Basic training, Food Safety level 2 certificate and your ENG1 medical you will be eligible to apply for the Junior Certificate of Competence (CoC). The CoC is an award gained at each level of the GUEST program based on the completion of the required modules. Have a look at the development plan to see the various training and service requirements for each CoC level. The CoC application form can be downloaded from the website. The application process will take 28 working days and you will be issued with the Junior Certificate of Competence. I was told that I need to complete a Training Record Book (TRB) on board? How can I get the TRB, who can complete it and what is its purpose? The Training Record Book has been designed as part of the blended learning process alongside the formal classroom based training. Its purpose is to guide your professional development within the interior department working from a more junior position to an advanced level. The TRB has three levels of assessments and tasks, from Seamanship and Shipboard knowledge, mid-level interior training leading to interior management training, and can be signed off by Captain/ Chief Officers for the seamanship sections and Chief Stew for the interior tasks and assessments. The TRB includes the Yacht Rating certificate, a very useful qualification to hold on your resume as it is a required “manning“ qualification for those assisting with bridge watches; a duty interior crew are often involved with especially on longer passages. I have shown my GUEST certificates to various Crew Agents and I am getting mixed messages to the value attributed to my training investment? Why is this? 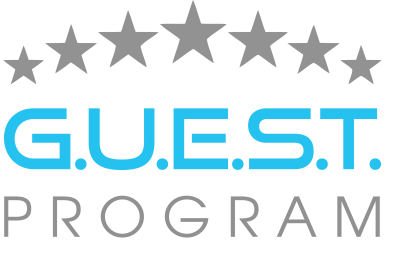 Many Crew Agents are extremely supportive of the GUEST program and in fact have contributed to its development over the years. These agencies understand the value of the training given to the individuals as well as the value it will bring to the boat they are placing you on. However GUEST is relatively new to the yachting sector and in fact training for the interior department is not a mandatory requirement under any maritime law. However as an industry led initiative, it is becoming better recognised and established. I guess it is taking a while for some placement agencies to understand what the GUEST training is all about. I am sure they all understand that placing someone who has invested in self-development will be more value to the yacht and guests experience than someone who has come to them with no or little previous formal education. We would be interested to hear about your experiences with agencies, espeically if they are not supportive. I am looking for a Chief Stew position on a 50 meter and although I feel confident with the job itself, I am struggling with the idea of taking charge and the added responsibility. Does GUEST help with this? I congratulate you for seeing the role you are now looking to step up to as a serious one. Your concerns about taking a managerial role with accountability and responsibility, and of leading a team who will be relying on you for mentoring and guidance, is not to be taken lightly. You are one of the many current yacht interior crew who have learnt on the job from your peers and Chief Stews. I am sure you are more than competent in the areas of training you have had from mentoring, self-study and experience. However it might not be a bad idea to look at the Advanced GUEST courses available and “brush up” as well as learn some of the skills sets that might be missing. It’s inevitable that you won’t have learned everything in just a few years without any formal education. And as the “Chief Stew” you will be expected (and probably would like) to know more than your junior crew. Under the Chief CoC, we recommend the comprehensive Management and Leadership Modules, both training courses offer the bespoke skills you need to confidently manage your department, as well as the ISM, Accounting and budgeting modules. There is also a PYA accredited Purser course that includes all these courses leading to the issue of a Chief Stew HOD CoC. My original background was in hospitality management and hotels before working in yachting and becoming a Chief Stew - can I apply for a Senior or Chief Stew CoC? Yes of course! We welcome those who have come from formally trained background and have extensive experience. The PYA offers a service where we can assess your current achievements and previous service, academic education and experience through the Assessment Route. The Assessment route offers individuals like yourself a gage as to where you fit into the GUEST program. We map your previous academic awards and references with the GUEST modules. We send you an assessment letter to let you know where you are regards the level for issue of a CoC and if there would be any further training requirements to be completed before a CoC was awarded.